Apple's Photos has powerful tools for making your pictures you spectactular. In my previous column I illuminated some hidden features in Apple Photos that can quickly make your cherished images look their best. In this column, you’ll learn to adjust brightness in specific areas and copy all your adjustments from one photo to many others. Photos for Mac sports some seriously advanced image editing controls in its Adjustments panel, the most powerful of which is Levels. Amazingly, while a Levels adjustment in Photoshop or Photoshop Elements has just three sliders, Photos has eight. This gives you precise control over the brightness levels of all the tones in your image. 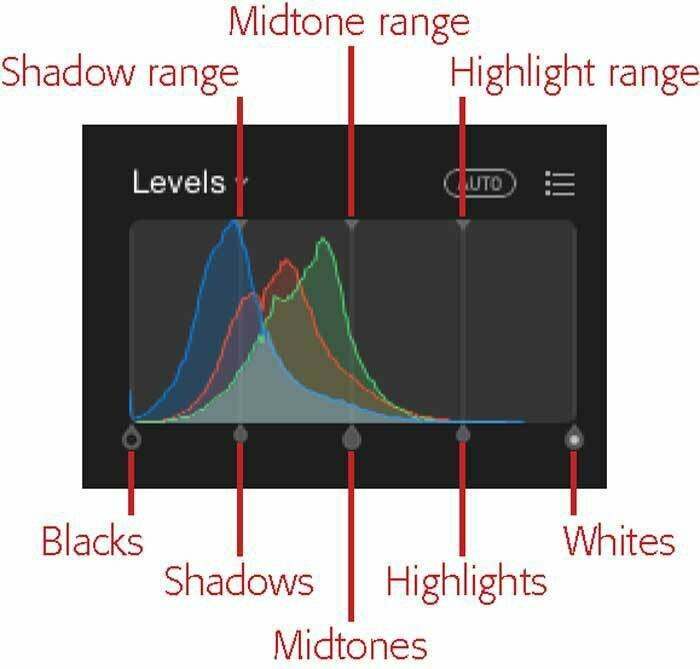 For example, you can control brightness levels in just the darkest shadows, just the midtones, just the lightest highlights, in the tones that fall between shadows and midtones, and in the tones that fall between midtones and highlights. To open a Levels adjustment for a selected image, first press the Return key to make sure you’re in Edit mode, then in the list of tools on the right, click Adjust to open the Adjustments panel. If Levels doesn’t appear in the list of Adjustments, click Add at the top right of the list and choose Levels from the resulting menu. Hover over the Levels section that appears in the list of Adjustments to see the controls shown in the image below. If you click the Auto button, Photos will try its best to improve all the brightness levels in your image. If you like what you see, you’re done. Photos’ Levels controls. Use these eight Levels sliders to fix your images. To adjust the image even further, drag the sliders at the bottom to the right or left to increase or decrease the brightness in each range of tones. To change the range of tones being affected by the bottom sliders, drag the top sliders left or right. When you move the sliders, Photos adjusts the image’s tonal values accordingly. For example, if you drag the Whites slider left to (an imaginary setting of) 85 percent, Photos changes all the pixels that were originally 85 percent or higher to 100 percent (pure white). (Translation: They get brighter.) Similarly, if you move the Blacks slider right to (an imaginary setting of) 5 percent, Photos darkens all the pixels with a brightness level of 5 percent or lower to 0 (pure black). Photos also redistributes the brightness levels between 5 percent and 85 percent, boosting the image’s overall contrast by increasing its tonal range. Whipping pictures into shape can involve a lot of time and slider scooting. If you’ve got a bunch of pictures that require the same fixes—for example, they were all shot at the same time with the same lighting conditions—it’d be tedious to repeat your efforts on every…single…photo. Fortunately, you don’t have to do that. You can simply copy your adjustment settings from one photo and paste them onto another. This can be a gigantic timesaver if you have a slew of images taken under the same lighting conditions. Apple put a lot of thought into the Copy Adjustments command. Because you only want to copy and paste general changes—those that affect lighting and color—that’s all the command does. In other words, the only stuff that gets copied are the changes you make with the Enhance and Filter tools and the Adjustments panel. Changes you make with the Rotate, Crop, Retouch, and Red-Eye tools aren’t included. Unfortunately, you can only paste changes onto one photo at a time; you can’t select 100 thumbnails and paste changes onto all of them in one fell swoop. But if you’ve got a bunch of pictures to paste edits onto, you can speed up the process by opening Photos’ thumbnail browser and using the arrow keys on your keyboard to navigate through the pictures. To see the thumbnail browser, switch choose View > Show Thumbnails or press Option-S. Use the arrow keys to move from photo to photo and then press Command-Option-V to paste your changes onto each one. Now that you know how to adjust brightness levels in any area of your photo and how to copy adjustments from one photo to many others, take a break. Breathe. Then come back and apply your new-found expertise to many photos as you like! Until next time, may the creative force be with you all!